Yup! Not one – but two! I’m feeling very pleased with myself! 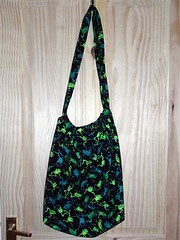 I made my bag from Issue 14 of “Sew Hip” as promised. It was really easy to make and I want to make lots more. In fact, Chloe is making one for herself too so I’ll post a pic of that when it’s finished. I didn’t waste the leftovers either – I made this from the 25cm scrap that was left. I found the pattern on http://www.knitting-and.com/embroidery/skullbaggy.htm . I did adapt it a little bit as I used just the one piece and stitched up the sides. Chloe is going to use it to keep her trainers in for school (maybe she’ll manage to come home with both shoes this time!). It’s been weeks and weeks since I blogged last – we’re only just back online. I have to say it’s not been a brilliant start to the New Year – just before Christmas our poor house was diagnosed with dry rot. It’s an absolutely horrible fungus thing that spreads like crazy and the treatment is pretty radical. So basically, since Christmas we’ve been living on a building site while the builders hacked off infected plaster, ripped up floors and pulled out windows. Anything of value has had to be packed in polythene to stop the phenomenal amount of dust getting into it. So I’ve had no computer and no sewing machines for weeks! The good new is the work is all finished bar the decorating. The bad news is that it’s cost us a fortune (many thousands!) so hubby and I are thinking up ways of making extra cash. Think I need to pull my finger out and start doing a few craft fairs ….. Anyway – frogs. 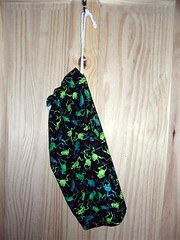 Check out this really fab fabric. I picked it up in Butterfly Fabrics in Cardiff yesterday. I’m going to make the bag in Issue 14 of Sew Hip magazine. It looks nice and roomy, which is good because I tend to carry half a ton of junk round with me. I’ll get hubby to take a pic of it when it’s finished.